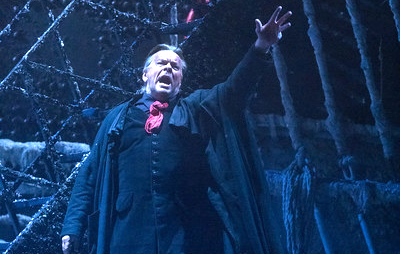 The Met revives Der fliegende Holländer. Der fliegender Holländer. Photo by Richard Termine © 2017 The Metropolitan Opera. 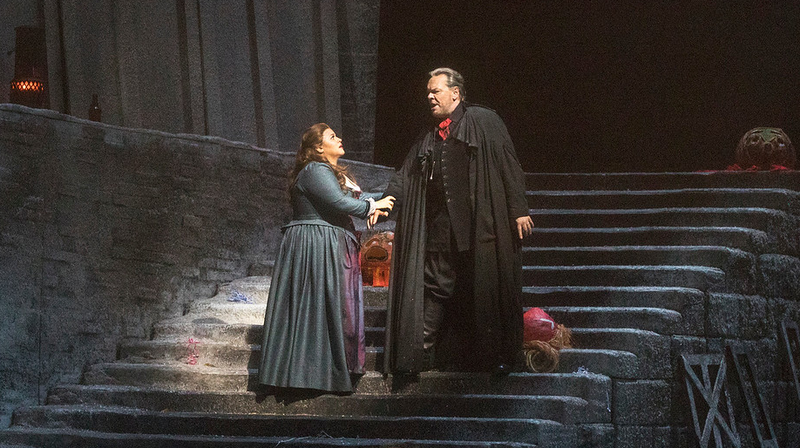 There's been a lot of excitement about the Metropolitan Opera's late-season revival of Der fliegende Holländer ("The Flying Dutchman") which opened last week and was seen by this writer at Saturday's matinée performance. This revival marks the first Wagner excursions at the Met for both Yannick Nézet-Séguin, the company's newly anointed incoming music director, and baritone Michael Volle, who has been tabbed by general manager Peter Gelb as both Wotan and Hans Sachs in seasons to come. Manhattan School of Music unearths Die Zigeunerbaron. True love wins the day in the last scene if Die Zigeunerbaron. Photo courtesy Manhattan School of Music. Johann Strauss Jr. was the most popular composer of the Austrian Empire, and his waltzes still provide the social soundtrack of Vienna for the tourists that visit that city every year. However, with the exception of Die Fledermaus, his stage works have disappeared from the operatic repertory. This is a reflection of the general state of light opera and the changing tastes of a fickle public. The Manhattan School of Music has taken a huge step to correct this by choosing to end their spring season with Der Zigeunerbaron (”The Gypsy Baron”) an energetic operetta that is rarely seen anymore outside of a Viennese theater. "And all you can come up with is 'Big Nose.'" 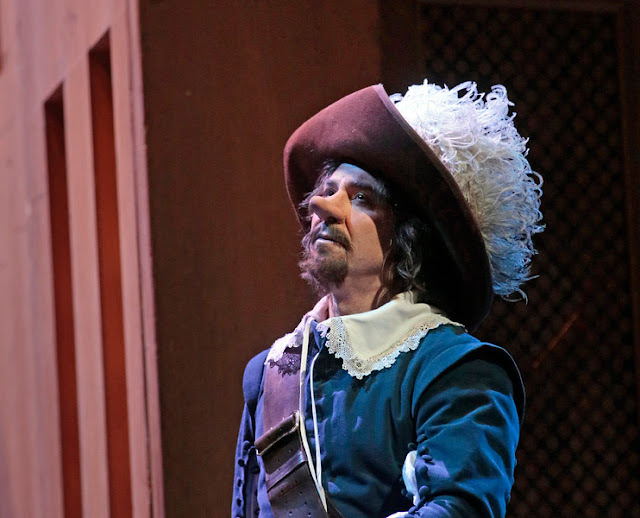 This isn't The Nose: Roberto Alagna as Cyrano de Bergerac. Franco Alfano is remembered today as a footnote. He's the guy saddled with the unenviable task of writing the final pages of Giacomo Puccini's last opera Turandot in 1924. That completion was dismissed in 1924 by Toscanini himself. However, his six operas survive. This is the first Metropolitan Opera revival of Cyrano de Bergerac. Soprano Natalie Dessay returns to Carnegie Hall. Natalie Dessay. Photo © Sony Classical. Natalie Dessay is no stranger to adversity. Throughout her career, the French soprano has battled ahead, undergoing surgery to keep her voice in fighting trim and dazzling audiences with a high coloratura that was at home in Donizetti, Mozart and Richard Strauss. Ms. Dessay retired from the operatic stage in 2013, with her last Metropolitan Opera appearances coming in a tumultuous run of Handel's Giulio Cesare in Egitto. Four years went by until her return, which came on Wednesday night upon the hallowed boards of Carnegie Hall. Juillard Opera mounts Kat'a Kabanova. Bad romance: Boris (Gerard Schneider, left) woos the heroine (Felicia Moore) in Juilliard's Kát'a Kabanova.Photo by Hiroyuki Ito for the Juilliard School. In retrospect, it is a pity that the Czech composer Leos Janacek did not find fame and fortune as an opera composer until the 1916 premiere of the revised version of Jenůfa, when the composer was 62. Káťa Kabanová, based on a Russian play, was written five years later. On Tuesday night, at the third of three performances at Peter Jay Sharp Theater, the Juilliard Opera showed that this rarely performed tragedy remains one of the composer's most potent creations. The noisy return of the New York Philharmonic. 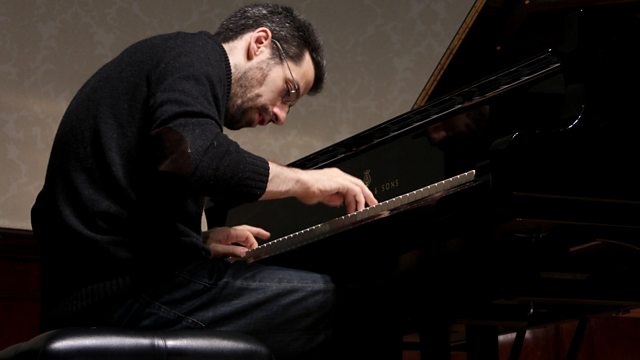 Pianist Jonathan Biss doing what he does. The New York Philharmonic are back from their 2017 European tour. Thursday night marked the ensemble’s return to its home stage at David Geffen Hall with a program of heavyweight orchestral works by Berlioz and Elgar, flanking a pair of interconnected piano concertos with soloist Jonathan Biss. At the podium: the young Irish conductor Courtney Lewis, making his subscription debut. 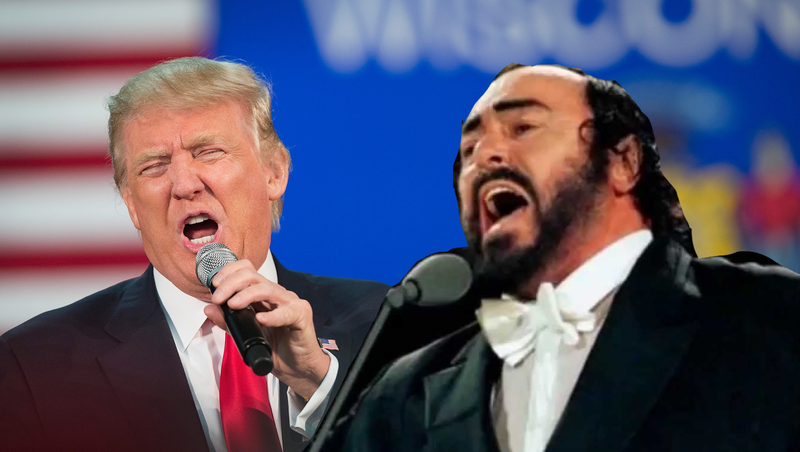 Donald Trump brings back Luciano Pavarotti. This didn't really happen....or did it? Luciano Pavarotti sings with Donald Trump. An unexpected gaffe by United States President Donald Trump on Thursday afternoon may lead to an unexpected career spotlight for Luciano Pavarotti, the beloved opera tenor who died in 2007. Today, speaking at the White House in a joint press conference with Italian prime minister Paolo Gentiloni, Mr. Trump said: "Through the ages your country has been a beacon of artistic and scientific achievement. That continues today." He then referred to Mr. Pavarotti and his friendship--twice: "From Venice to Florence to Verdi to Pavarotti--friend of mine," President Trump said. "Great friend of mine," he added. Or maybe I'm just getting less picky. 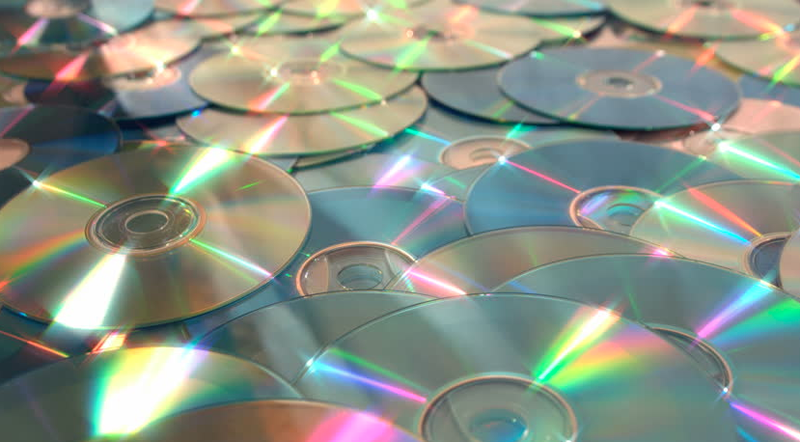 When I was setting out to build a classical music library, it was a very exacting process. Every recording that I bought, with my limited grad school budget, had to be perfect. Of course none of them were. But I well remember an insane bike trip through the Back Bay fens and down Charlesgate to trade my copy of the Bernard Haitink Ring in for the Solti and obsessing over various Aidas before discovering that I liked Claudio Abbado's. Hey, I was 22. Many partings mark the Met's new Rosenkavalier. 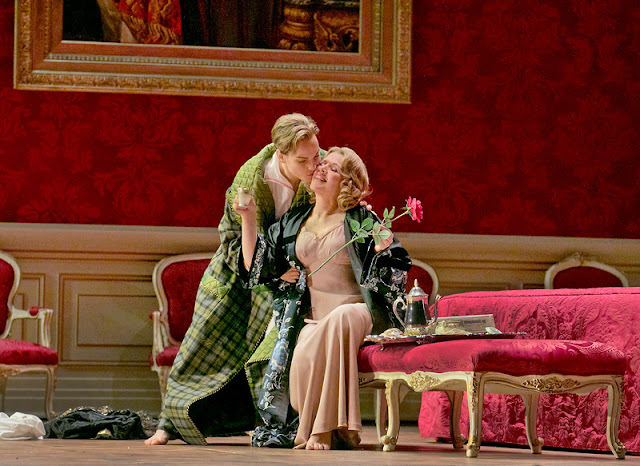 Kiss the girls: Octavian (Elīna Garanča) woos the Marschallin (Renée Fleming) in Act I of Der Rosenkavalier. Photo by Ken Howard © 2017 The Metropolitan Opera. The end of an era is the subject of Robert Carsen's fascinating new production of Der Rosenkavalier which bowed at the Metropolitan Opera on Thursday night. Updated to Vienna in 1910 (the year of the opera's genesis) this show crackles with nervous energy, a wild party on its final round of the night. Fittingly, this show also marks Renée Fleming's final appearances as the Marschallin in this opera, a part she has played at the Met since the year 2000. Yannick Nézet-Séguin steers into Wagnerian waters. 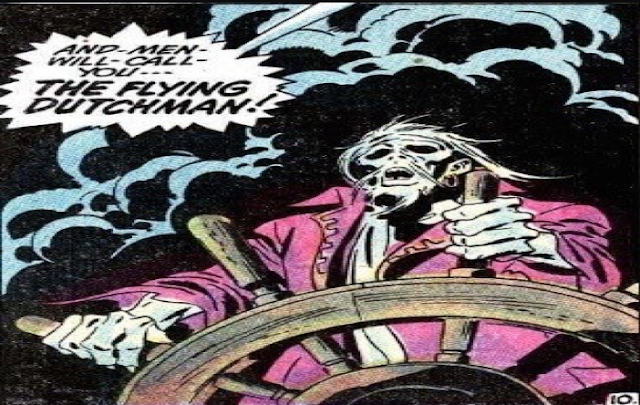 Out to sea: Michael Volle as the Flying Dutchman. Photo by Richard Termine © 2017 Richard Termine courtesy the Metropolitan Opera. Yannick Nézet-Séguin became the future of the Metropolitan Opera when he accepted the role of music director-to-be at the opera house. Here, audiences can hear him cnduct Wagner at the big house for the first time, as he dips into the stormy waters of Der Fliegende Holländer. The San Francisco Symphony encapsulates Mahler's career. 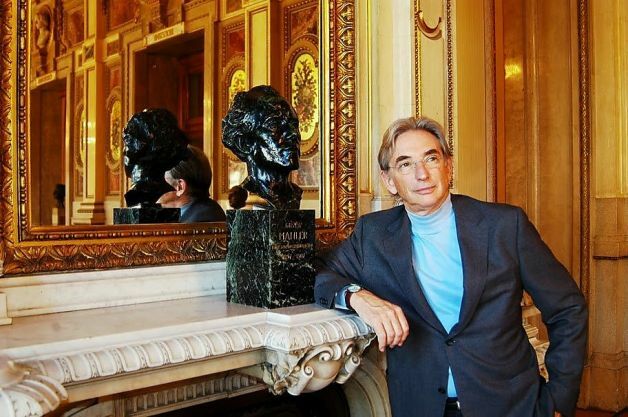 Busted: Michael Tilson Thomas (right) with Rodin's bust of Gustav Mahler. When Gustav Mahler died in 1911, he was working on the Symphony No. 10. He had completed sketches of its five movements, and the orchestration of the opening Adagio. On Saturday night, Michael Tilson Thomas and the San Francisco Symphony paired that movement with the composer's Symphony No. 1, offering a fascinating look at the end and beginning of a composer's legend. The San Francisco Symphony returns to New York. 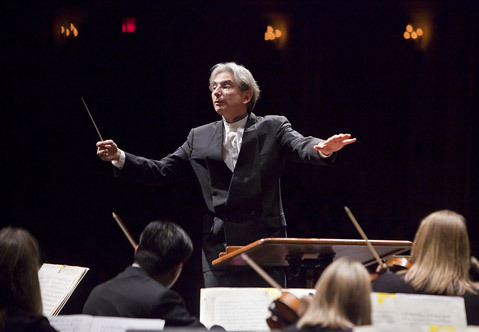 Michael Tilson Thomas at the helm of the San Francisco Symphony. The conductor Michael Tilson Thomas is in his third decade at the helm of the San Francisco Symphony, one of the longest and most consistent runs of a music director in a music business where maestros change podiums like NFL quarterbacks switching teams in free agency. Valery Gergiev conducts Debussy, Schubert and Mahler. 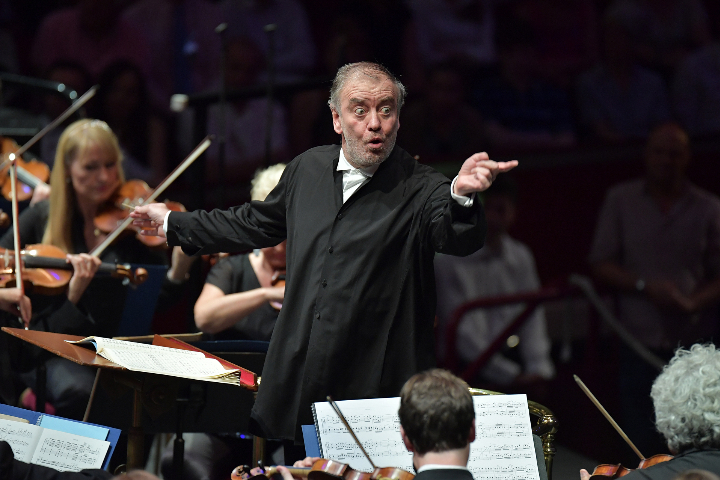 An intense moment with Valery Gergiev. Photo © 2017 Mariinsky Opera. Any concert under the leadership of Valery Gergiev can be an uncertain affair. His unconventional conducting style, with fingers a-tremble, an impetuous beat and miniscule baton (sometimes no bigger than a toothpick!) gets results, and they're always at least worth writing about. On Wednesday night at Carnegie Hall, Mr. Gergiev, the newly installed principal conductor of the Munich Philharmonic led his troops in exploration of Debussy, Schubert and Mahler, using his unique podium style to offer fresh and yes, successful insight into these three different composers. For this concert, he used a conventional, (although small) baton. 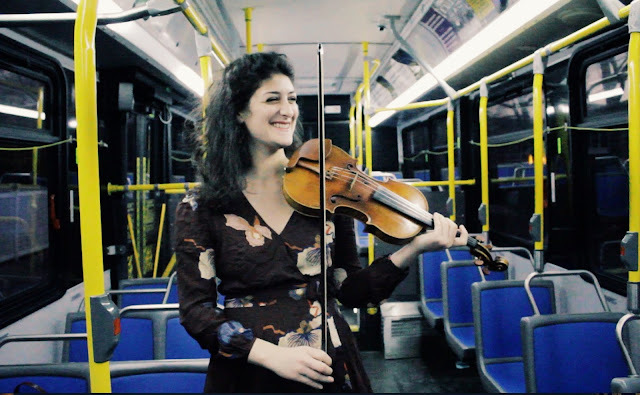 The violinist has the keys to Bach's solo repertory for her instrument. Photo © The Juilliard School. "There are so many ways in to this music." Violinist Michelle Ross is speaking of the height of the repertory for her instruments: the six Sonatas and Partitas for solo violin by Johann Sebastian Bach. She last played these works on December 27th in a complete cycle. On Sunday at Le Poisson Rouge, she will offer Discovering Bach, interspersing movements from the six with pieces from Messiaen and Ravel. 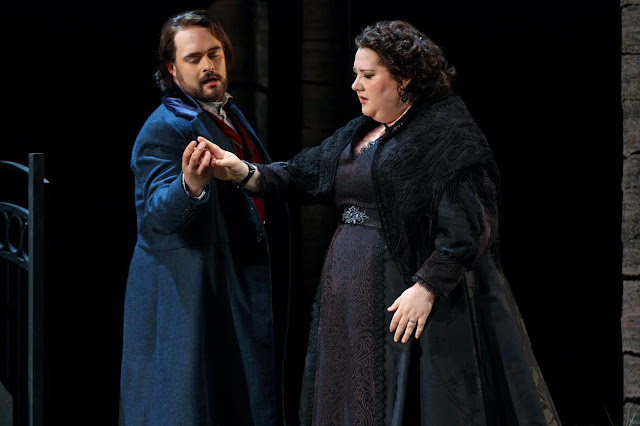 A new Violetta in the Met's La Traviata. Carmen Giannatasio as Violetta in the Met's La Traviata. The Metropolitan Opera's current staging of Verdi's La Traviata is indicative of a demographic split in the company's audience. Older opera-goers (the company's dwindling subscription base) bemoan its stark visuals, longing for the Franco Zeffirelli-designed puff pastries of seasons past. The younger set (whose loyalty is needed for the opera company's survival) like its simple iconography, stark social commentary and snazzy costumes. 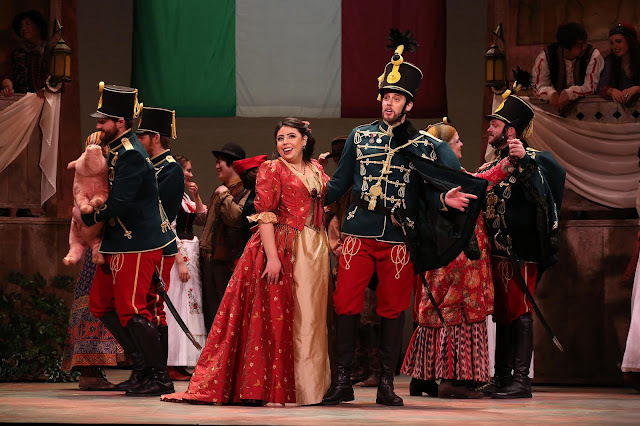 On Tuesday night, several women in the orchestra seats even cosplayed as Violetta, donning red heels and that scandalous red dress in homage to the opera's fallen heroine. Valery Gergiev conducts Beethoven and Ravel. 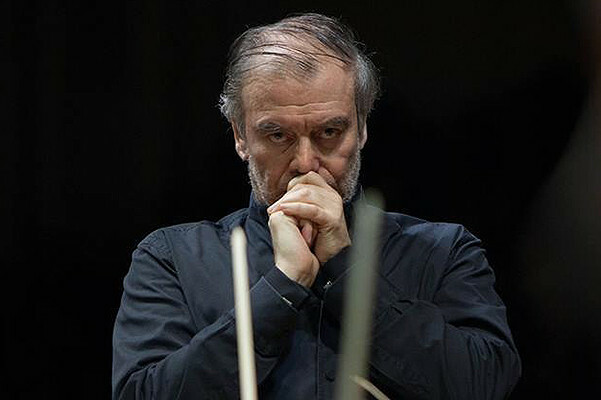 Valery Gergiev at the helm of his Munich forces. Photo by Chris Christodoulou at the BBC proms © 2016 The British Broadcasting Company. An evening with Valery Gergiev on the podium is never dull. The Russian maestro returned to Carnegie Hall on Monday night with his new orchestra, the Munich Philharmonic, and a conservative but lucid program pairing the works of Ravel and Beethoven. This concert marked the first appearance of Mr. Gergiev as the music director of the Munich forces, although he did substitute duty for an ailing Lorin Maazel two years ago. New York City Opera dredges up La Campana Sommersa. 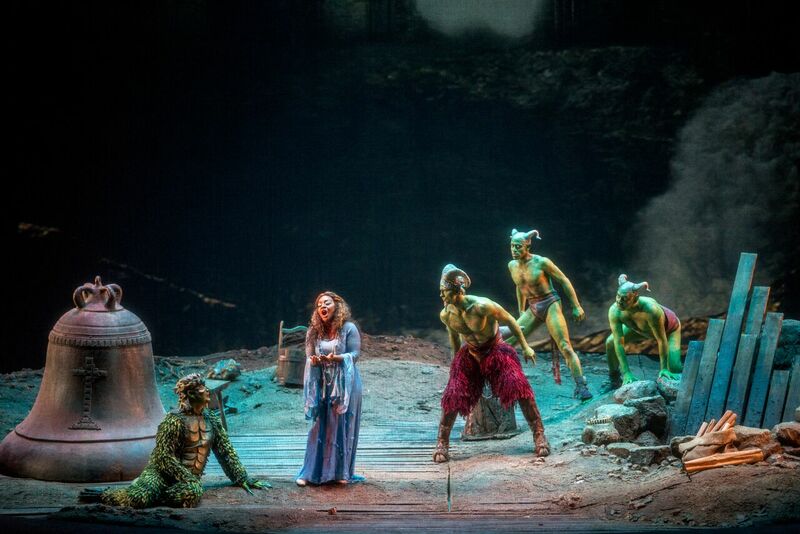 Rautandelein (Brandie Sutton, center) and Fauno (Glenn Seven Allen, in leggings) at New York City Opera. Photo by Sarah Shatz for New York City Opera © 2017. This week, the New York City Opera offered La Campana Sommersa ("The Sunken Bell") by Ottorino Respighi. This is an opera that has lain neglected at the bottom of the repertory for many years. A sensation in Hamburg, Germany when it premiered in 1927, La Campana made it as far as New York and the stage of the Metropolitan Opera. There, it sunk to the bottom of the repertory where it has lain undisturbed since 1929. The St. Louis Symphony Orchestra offers John Adams' The Gospel According to the Other Mary. 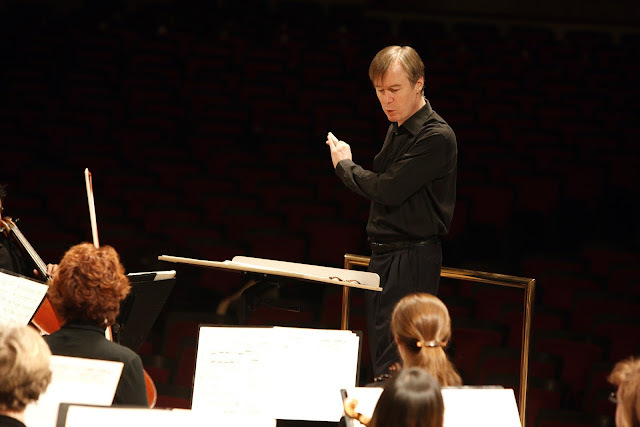 At the controls: conductor David Robertson. Photo by Scott Ferguson. There is some debate as to whether The Gospel According to the Other Mary, the 2013 work for soloists, chorus and orchestra by composer John Adams, is an opera or an oratorio. For Friday night's performance at Carnegie Hall, conductor David Robertson chose the latter option, presenting a straight concert performance of this two-act work on the wide but shallow stage of Stern Auditorium. Viennese waltzes and bed-hopping: Strauss' comedy gets a new staging. Met's new production of Der Rosenkavalier. Renée Fleming has owned the role of the Marschallin in Richard Strauss' Der Rosenkavalier at the Met for the last two decades. 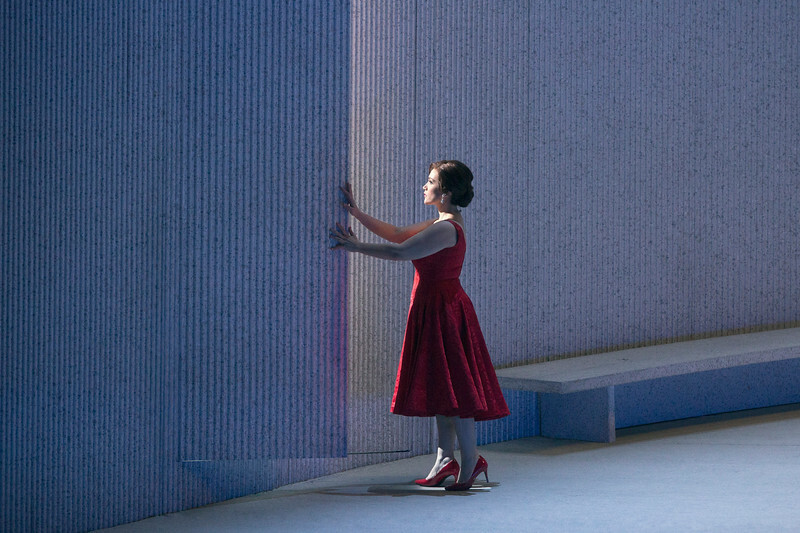 Here, she appears in a new production opposite a new Octavian, mezzo-soprano Elīna Garanča. 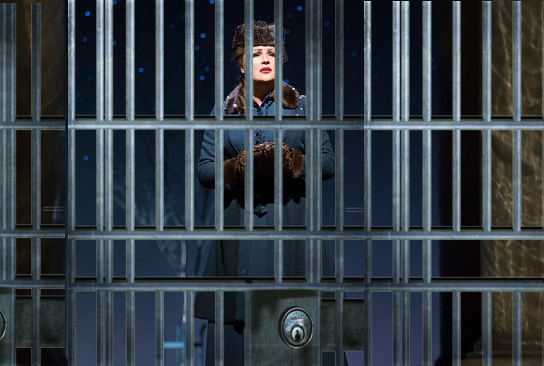 The Met may send Anna Netrebko to the gulag. Anna Netrebko. Photo by Marty Sohl. The Metropolitan Opera has been offering glimpses of its future in the New York Times this week. In an interview with Michael Cooper, incoming music director Yannick Nézet-Séguin promised that new productions of Aida and Salome would open future seasons, each starring Anna Netrebko. Superconductor has learned that a third is on the schedule for the Russian diva: a new version of Janacek's From The House of the Dead. Steve Reich’s Three Generations opens with John Adams and Terry Riley. 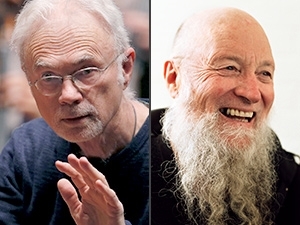 John Adams and Terry Riley. Their music was celebrated on Thursday night at Zankel Hall. The composer Steve Reich currently occupies the Debs Composers' Chair at Carnegie Hall. That makes 2017 a good spring season for New Yorkers whose tastes run to the masterworks of the late 20th century. Two of those masterpieces were programmed on Thursday at the opening night of Three Generations, a four-concert series that Mr. Reich is curating at Carnegie’s subterranean venue Zankel Hall. Following the performance, Mr. Reich led a short discussion with fellow composer John Adams and Brad Lubman, leader of the evenings performance.